Posted by Yilan in Balkan, EU, European Union. EU countries will be able to reimpose a visa requirement on visitors from the western Balkans, under new rules proposed by the European Commission. 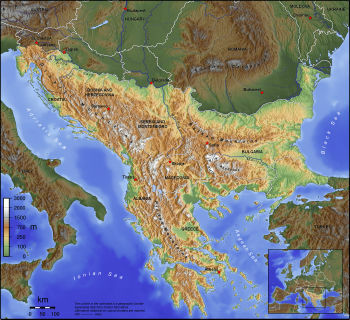 Since December 2009 nationals of Serbia, Macedonia and Montenegro have not needed visas to enter the Schengen zone, which includes most of the EU. But Belgium and some of its neighbours have complained of a rise in asylum claims since the visa waiver came in. This year 544 such claims from Serbians have been registered in Belgium. That figure is higher than for the whole of 2009, the Belgian national broadcaster RTBF reports on its website. A high number of the asylum claimants are ethnic Roma and Albanians from the south of Serbia, RTBF says. Belgium’s Migration Minister Melchior Wathelet flew to Belgrade this week to discuss the issue with Serbian officials. The Schengen Agreement, which dates back to 1995, abolished internal borders, enabling passport-free movement across much of Europe. The Schengen zone covers 22 EU states and three non-EU countries – Iceland, Norway and Switzerland. Now the Commission is recommending a “safeguard clause” that would allow Schengen countries to restore a visa requirement for non-EU countries, in cases where the visa waiver has led to irregular migration or abuse of the system, such as asylum claims from economic migrants. EU interior ministers are expected to approve the change next month. 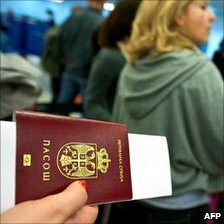 The visa waiver was intended to ease travel for Balkan holders of biometric passports planning short stays in the EU. Last December the waiver was extended to citizens of Albania and Bosnia-Hercegovina. The countries covered by the waiver all hope to join the EU. The Schengen rules are now under review because France, Italy and some other countries want more flexibility to reinstate border controls. The review was prompted by an influx of migrants fleeing the strife in North Africa this year. Most of them arrived on the tiny Italian island of Lampedusa, creating an emergency for the authorities there. Posted by Yilan in Balkan, Macedonia, Turkey. Macedonia and Turkey signed Friday an agreement on military-financial cooperation. It envisages Turkey to donate military aid to Macedonia at its own choice in amount of one million US dollars in 2011. In addition to the agreement, Turkish Defence Minister Vecdi Gonul – who is paying an official two-day visit to Macedonia together with a delegation of the Turkish Ministry for National Defence – is due to hand over a $253,000 donation to the Macedonian Army (ARM). After signing the agreement, Gonul said that even though Macedonia and Turkey didn’t share a joint border, the Turkish people were perceiving Macedonia as their closest neighbour. “Turkey is not only the first country that recognised Macedonia and sent an ambassador, but it also recognised the country together with its millennium-long historical past, not with some abbreviation,” the Minister said. He added that Macedonia since his first visit back in 2004 had significantly advanced in the field of defence and democracy. “Today’s signing of the agreement is a step forward in establishing a higher cooperation on the existing excellent cooperation between the countries. Bilateral cooperation especially in the field of defence industry will be significantly reinforced,” Gonul stated. Posted by Yilan in Balkan. The Legatum Prosperity Index is the world’s only global assessment of wealth and wellbeing; unlike other studies that rank countries by actual levels of wealth, life satisfaction or development, the Prosperity Index produces rankings based upon the very foundations of prosperity those factors that will help drive economic growth and produce happy citizens over the long term. Bulgaria is ranked 46th, Croatia is ranked 38th followed by Greece at 39th, FYR Macedonia ranked 72nd, Romania 51st, Slovenia 21st in the rankings and Turkey ranked 80th among 110 countries worldwide in the 2010 Prosperity Index of the Legatum Institute.